Maybe it’s something you fancy trying? Studies have shown that some people who eat vegan diets have less chronic disease, including heart disease, than people who do not follow a restrictive diet. Others report general improvements in energy and vitality, and exclaim that they’ve ‘never felt better’. Stories of successful vegan athletes and sports stars are on the increase, and plant-based living is regularly profiled in health and wellness publications. There are many reasons people decide to try vegan. The Veganuary Challenge being just one. Many combine Veganuary with their ‘New Year’s Resolutions’ and see trying vegan as the healthiest start to the year. 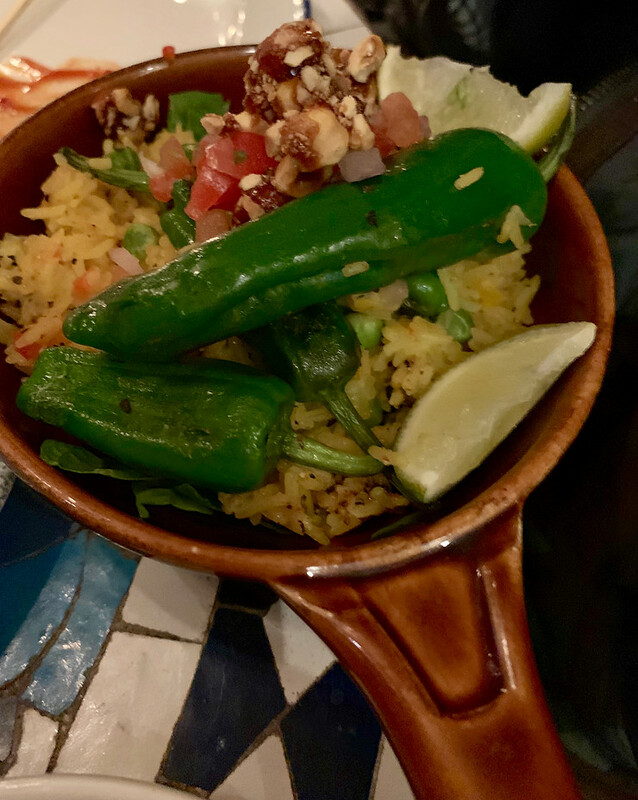 To dispel the myth that there isn’t a lot of food around for Vegans, or that if there is it’s bland, step up Revolucion De Cuba. Their Vegan menu offers the chance to discover a whole new world of taste and flavour to even the most skeptical of diner. As we left the house to visit the Restaurant located on Nottingham’s Market Street. I smelt a familiar cooking aroma. “What are you doing?, We’re going out” I said to my partner. Turns out he was cooking sausage rolls, convinced he would come away hungry. Of course, I knew from that point that the challenge was on to convert a staunch meat eater.I made a bet that at some point during the evening he would turn to me and say he was full. Spoiler! Thankfully, I was right. The Restaurant is right bang in the middle of the city centre. 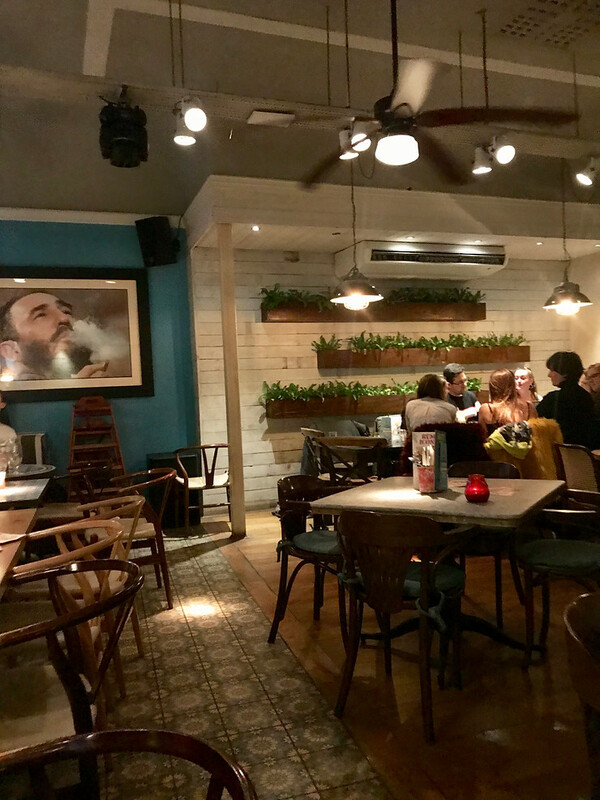 Located fantastically for public transport, a post work drink, a pre – theatre meal or tapas with friends. It’s located in a beautiful old building, the entrance adorned with candles lighting the way. Inside the decor is a mixture of blue and white. Blue walls, blue and white mosaic tables, accessorised with red candles – a nod to the Cuban flag no doubt. There is a separate vegan menu, which makes things simpler, as opposed to scouring the main menu, and there’s plenty of choice. Pinchos while you wait, Main plates, Tapas, sides, desserts as well as Brunch and Lunch. As I’ve been invited to review the menu we decide to go for the Tapas. 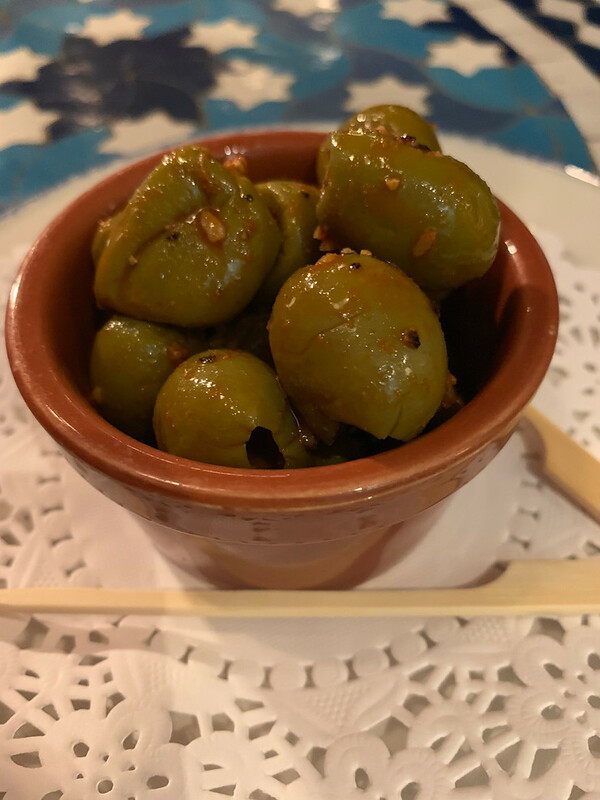 Meaning Small Plates, Tapas can sometimes vary in size at each restaurant, from learning by mistake, I find its better to ask the server how many they recommend. Obviously it can vary on the the diner in question, but they can usually give you a good idea. Our server was happy to chat and assist, in fact she was a very lovely bubbly woman, with a smile every time she spoke. She recommended three each. Uh Oh – there’s seven on the menu. After trying to decide for far too long (I forgot to mention that our server was also very patient) We made a huge decision – we let our server decide. She decided we should try them all. Fair enough. While we waited we enjoyed a bowl of Spanish Olives and a cocktail, or Mocktail in my case. I was driving, but I can highly recommend the Fruit Blast. Containing what is I assume an almond liquor it has a taste of Marzipan. A bit like amaretto but non-alcoholic. Oh and more refreshing. 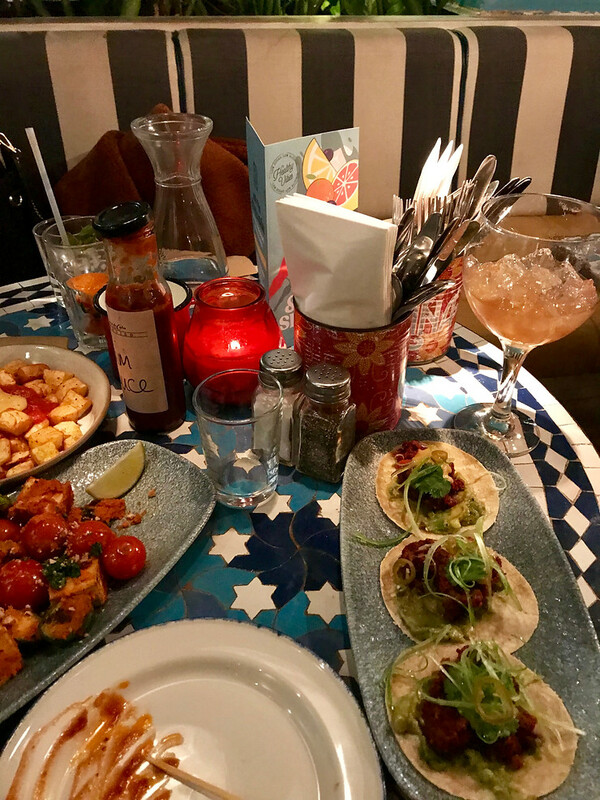 Our Tapas pretty much fill the table. We were in agreement that the Beetballs were our favourite. 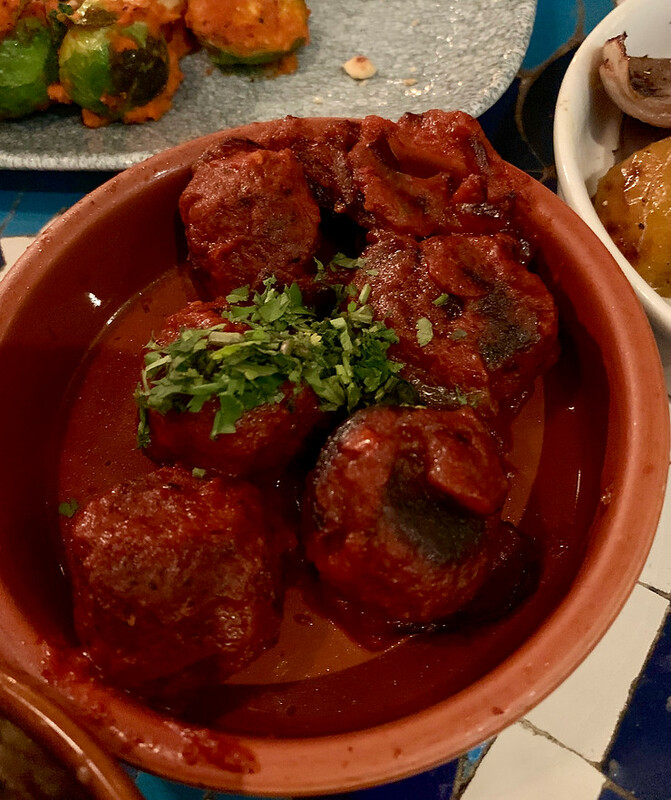 Made from beetroot, coriander and mint, and served in a rich tomato sauce, somehow these delicious little balls have a similar consistency to meat balls. 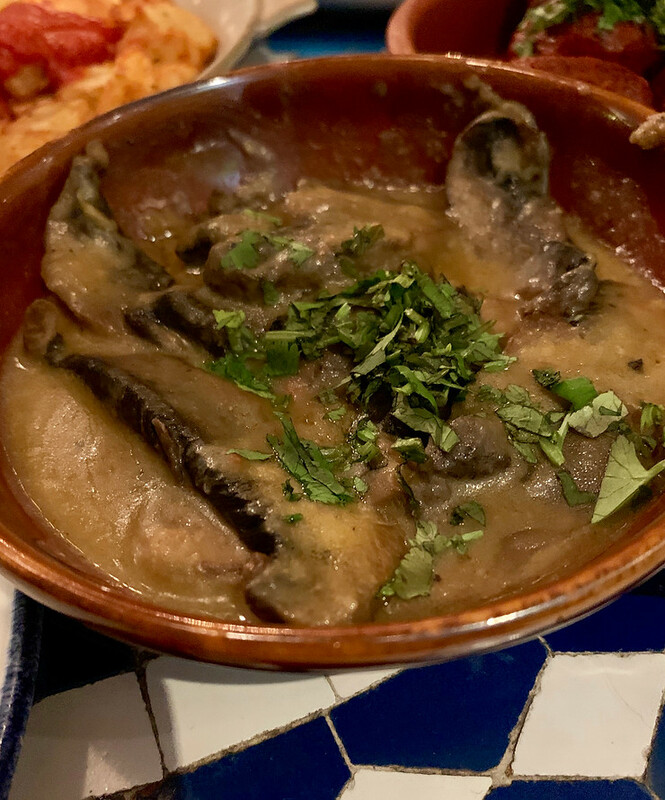 Garlic Mushrooms were one of the dishes we toyed with eliminating on our ‘choose six’ quest. Thankfully we didn’t, mainly due to our server telling us how lovely they are. She was right. Sautéed, not just in a rich garlic sauce but also a white bean sauce, it added an extra dimension. I’ve always loved Patatas Bravas and these were no exception. 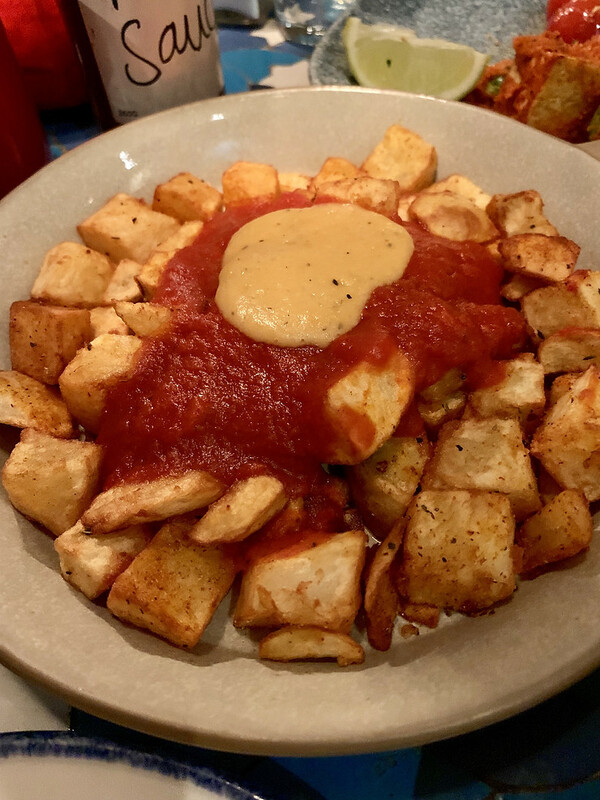 Topped with a spicy tomato sauce and white bean purée, these fried potato tapas essential were really tasty. The Beet and Avocado Taco are fresh parcels of tastiness. 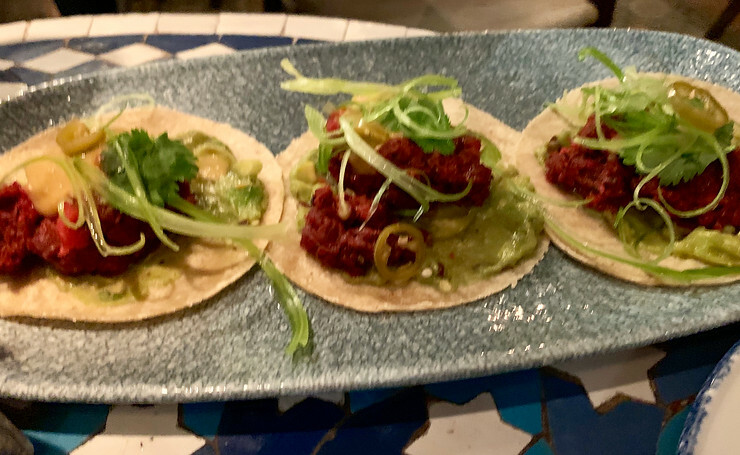 Bite size tortillas hold beetroot, coriander, and mint hash, fresh smashed avocado, white bean purée, spring onions and chillies. Eat it in one and experience the blend of flavours. I’m noticing white bean seems to be the secret ingredient in several of the dishes. A great way to provide a protein-rich, low-fat alternative to meat. The Arroz con Padron (Aromatic rice with spinach, Padron peppers and hazelnuts) wasn’t our favourite dish. The spinach gave the rice an almost, what I can only describe as an irony taste. The Padron peppers however were juicy and full of flavour and heat. Tofu can be notoriously bland, a persons first experience can put them off for good if its not used to its potential. 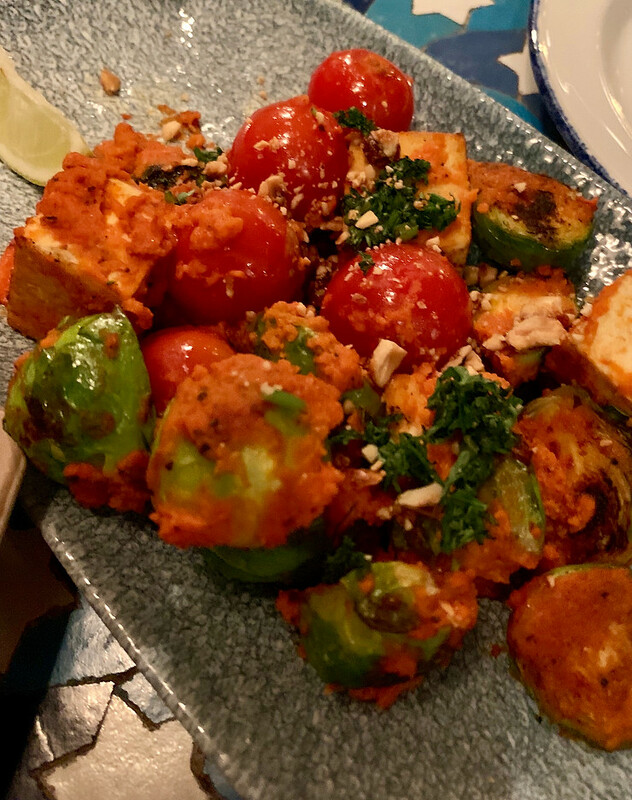 Thankfully this smoky paprika tofu had been prepared with care, absorbing the flavour of the Romesco. Served with sprouts and cherry tomatoes, it overs variety of textures too. 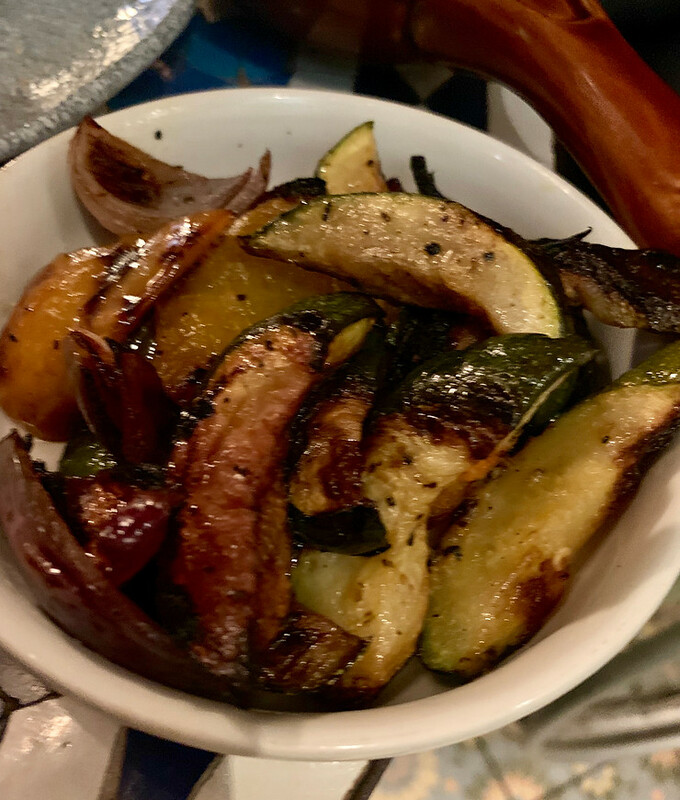 Finally the Roasted Vegetables. courgettes, peppers, sweet potato and carrot roasted in brown sugar – proved a simple dish can still be packed with colour and flavour. And here, dear reader. I hit my partner with the million dollar question – Are you full? and yes, he was. (Fist pump) We both were. So much so that I didn’t have a pudding (and I love a pudding) There were two vegan options: Chocolate and Raspberry Slice or Raspberry Prosecco Sorbet. 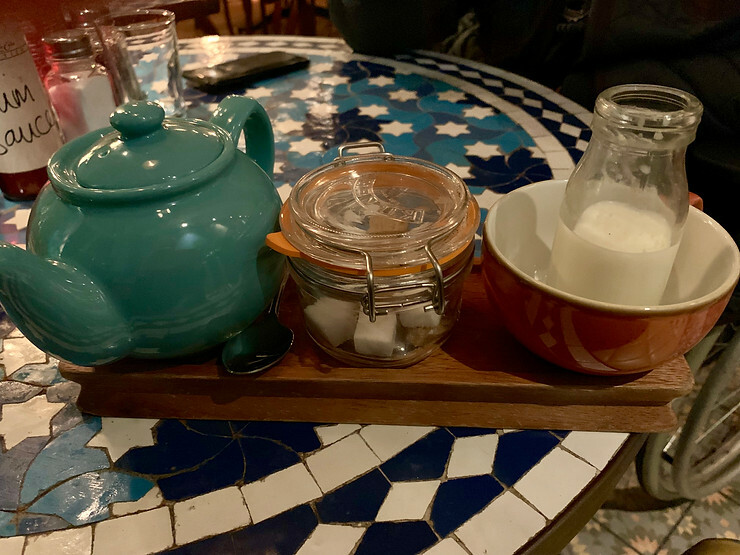 Instead I actually had a refreshing Green Tea. A lot of thought has clearly gone into the menu and not once did I miss not having meat on my plate. If I could eat like this, I think I could quite happily eat vegan every day. Veganuary? I’ve got a feeling it could last a whole lot longer. And yes, no sausage rolls were harmed in the writing of this review. Disclaimer: Our Meal was gifted but my views are my own.